Anne was born in Frankfurt, Germany in 1929. Four years later in 1933, she and her family moved to Amsterdam. On her 13th birthday (1942), Anne received an autograph book which she used as a journal. A month after her birthday, she and her family, along with a couple other close friends, went into hiding in a secret annex in the back of her father's business. In all, 8 people lived in these rooms for two years before they were betrayed and arrested by the Nazis. They were assisted by a number of non-Jewish Dutch, two of whom are arrested at the same time as those in hiding. Of the 8 that were arrested and sent to various concentration camps, Otto was the only survivor. Upon liberation, Otto returned to the secret annex to search for his family. After their arrest, the secret annex was cleared out by the Nazis. Two of their helpers had managed to save Anne's diary in the hopes that they could return it to her after the war. However, upon hearing that Anne had doied, they gave it to Otto. After reading it himself, and knowing how much his daughter had wanted to be a writer, he had it published. In the 1960s, the secret annex was turned into a museum. At Otto's request, the rooms remained unfurnished, just as they were when he returned. When you first enter, you go through the part of the building that originally housed the business. You see the spaces where equipment was located,and the old offices where meetings were held. And then you come to a bookcase. At first, it just looks like an ordinary bookcase. Plain, unadorned, something that could easily be overlook. It is the only furnishing in an otherwise empty house. But this is the bookcase that hid the entrance to the secret annex. This is the bookcase that, if discovered, would have led to the arrest of the 8 people in hiding and anyone else in the building at that time. For over 60 years, it's been sitting there, open, beckoning visitors to step up and over the threshold. Step into these secret rooms and imagine, if you can, what it would have been like for these rooms to be your whole world. It was here, in these small rooms where 8 people lived for over 2 years, completely dependent on their helpers for food, clothing, and news from the outside. There was a kitchen, a bathroom, a shared living room/dining room/bedroom, a couple other, smaller bedrooms, and the attic. The annex was quite large for being a hiding place, but the small room, blackened windows, and all encompassing need to remain silent must have been stifling for those who lived here. As you travel through the annex, you can imagine what it would have been like to live here as a teenager. How difficult, and frustrating, it must have been to hide your very existence, simply because you were born Jewish, but knowing that this existence, however disheartening it might be, was far better than the alternative that lay outside of those walls. As you walk through, it is almost as if there is an unspoken agreement to maintain the silence; perhaps out of respect to those that lived here, or to mimic the silence they were required to maintain to stay alive and hidden. On one wall are faint pencil markings showing the heights of Anne and her older sister Margot as they grew up in the Annex. I was actually surprised to find out she was quite tall. Well, taller than me. Anne's old room still had the pictures of movie stars and celebrities that she had carefully glued on the walls in an effort to make it a little less dreary of an existence. At this point, yes, they were alive, but not living, they were merely existing. Hoping and praying that there would soon be an end to the terror outside their walls and the horrors being committed. On more than one occasion, I had to choke back tears, not just for the girl who lived here, but for all those that history has forgotten, those who only left a name behind. The outside of the Anne frank House. It is the one On the left. Upon leaving the annex, you learn of the fate of those who were arrested. Pictures tell their stories and where they died. Videos are playing showing interviews with Anne's friends, and Otto years after the war ended. At the very end of the tour, the original pages from Anne's diary are displayed. They are not only a physical reminder of the girl who wrote them, and then rewrote them, with the hope that they would, someday, be published (the Dutch government has requested that personal accounts and diaries be kept, to be compiled after the war), but also a reminder of all those who were lost. She has become a voice for the voiceless. 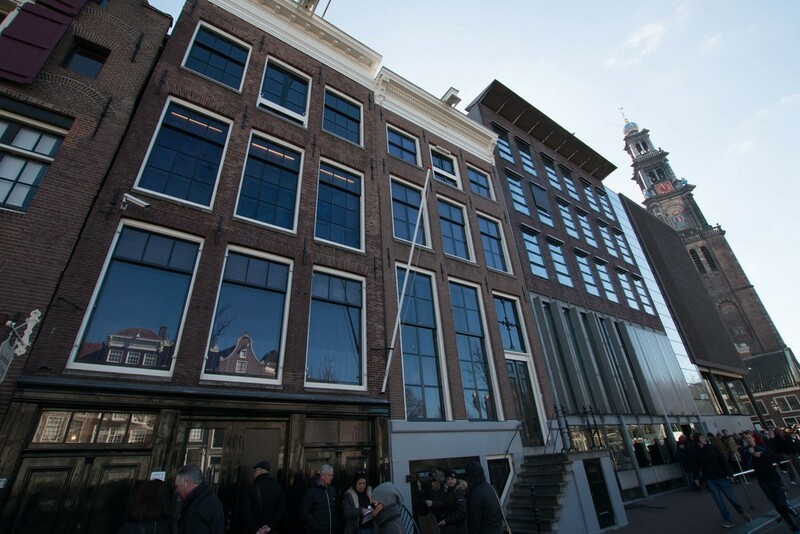 If you want to visit the Anne Frank house for yourself (and you should if you are in Amsterdam), we would suggest buying tickets ahead of time. We got there at 10 AM on Sunday morning and the line to get in was already wrapping around the block and looked like it was a three hour wait. Buying tickets online is easy and you print them at home. For more information on opening hours, ticket prices, and information about the museum and annex, visit the official website. Note that it is not allowed to take pictures inside the annex or the museum.